SUP Wheels paddle surf board carrier and kayak carrier will bear the majority of the weight. This is unlike the over the shoulder strap systems, where all the weight rests on you. With this innovative solution there is little to no issue with wind, as the board lies horizontal on the SUP carrier and not sideways against your body, like a sail. SUP Wheels will give you a better workout on the water and easier transportation after a long hard workout. With the largest wheels in the SUP carrier market, you will get to the water faster and easier with SUP Wheels ® whether you are rolling on a hard surface or soft sand. SUP Wheels is simply the best stand up paddle board & kayak carrier available today. 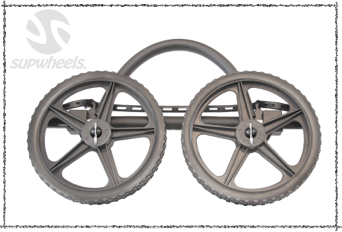 You can reconfigure the wheels into the patented storage configuration easily. Then take the unit with on your board or lock it up with your bike. There is no need to leave them on the beach. They only weight 7 pounds (3.2 Kg) and they float.